With every new day, families fleeing hunger and violence continue to pour into Baidoa, the capital of Somalia’s Bay region, desperately seeking refuge and assistance. 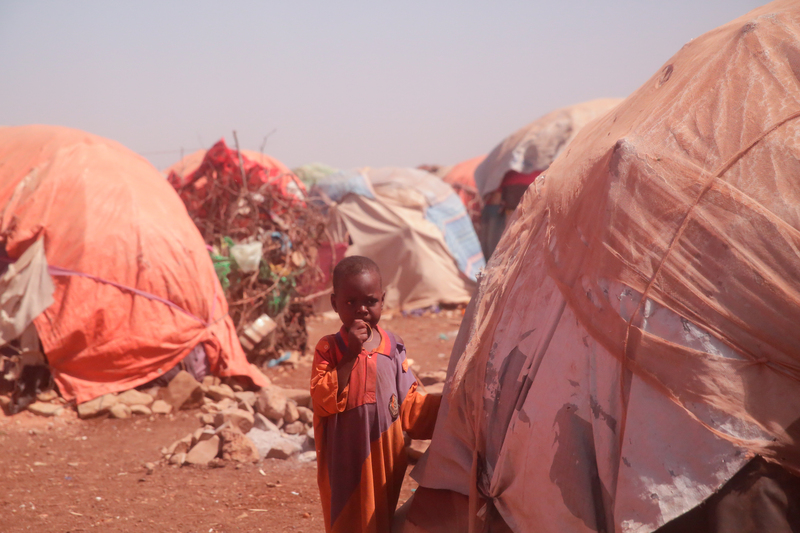 Baidoa hosts more than 300 camps for internally displaced persons (IDPs) on its outskirts, and in these temporary settlements are more than 400,000 people. Families set up temporary shelters made out of sticks and pieces of cloth; the start of a new life. “My children were all very weak, and I feared I would lose them to the biting hunger. I therefore decided to leave my home area and go out to look for rescue elsewhere,” Fakoso continues. Bay is one of the regions in Somalia where drought has driven people from their homes to search for life-saving humanitarian relief. With the prolonged lack of food and water, people in Bay are forced to drink unsafe water, exposing already vulnerable families to water-borne diseases like cholera. Temporary shelters at Banow IDP settlement. “We walked for five days to get to Baidoa, and that journey was the worst experience of my life,” Fakoso says with sadness written all over her face. “Along the way, my daughter—the mother of my six grandchildren—suffered from diarrhoea. She became so weak because we did not have food and was dehydrated due to lack of water. There were no health facilities to seek medication from. I did everything I could to save my daughter, but unfortunately I lost her,” she recounts with tears in her eyes. Fakoso’s main aim of leaving her home area was to find a better place where she and her children would thrive. Little did she know that she would lose her daughter along the way and also have all the 13 children to care for on her own. 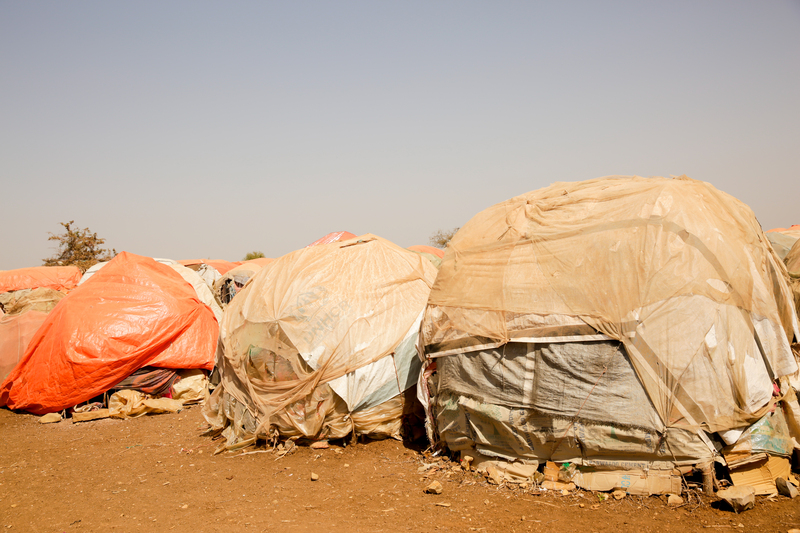 Upon arriving in Baidoa, she set up a temporary shelter at the IDP settlement. Pieced together with plastic sheeting and pieces of sack cloth, this makeshift structure is now what the family calls home. Having arrived at the camp with little else but the clothes on their backs, they now depend almost entirely on humanitarian aid to survive. International Medical Corps mobile teams visit Banow IDP camp once a week to provide primary health care, nutrition screening, and promote proper hygiene, which is critical to help prevent the spread of communicable diseases. Those who are severely ill are referred to Berdale health facility, which is also run by International Medical Corps and can provide a more advanced level of care. “Diseases spread easily at the camp. Recently, my grandson Abshir suffered from measles and Mohamed had pneumonia. I was worried I would lose them, but the nurses from International Medical Corps came one day and treated them for free!” she adds. Inside Banow IDP Settlement, a makeshift shelter is this young boy’s only home. International Medical Corps is on the ground responding to the needs of displaced Somalis by providing access to much-needed primary health care and nutrition services. With support of USAID’s Office of U.S. Foreign Disaster Assistance, our teams continue to provide lifesaving aid to the people of Baidoa as well as other parts of Somalia. For Fakoso and others who now call Somalia’s IDP camps home, there are two common worries: hunger and insecurity. It is Fakoso’s hope that the conflict will subside, allowing them to live without fear and leave the camps to find work so they can support their families. In a region plagued by consecutive poor and failed rains, many fear they may not be able to rely on farming for income anymore.